Crow didn’t think being able to see and talk to the wind was unusual. After all, he had been doing it all his life. But his father, his tribe’s elders and other children of his pueblo didn’t understand. They treated him like a child. All Crow wanted was a tribal name—the mark of adulthood. But can he earn their respect? 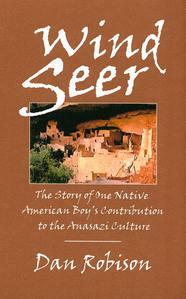 Wind Seer is the story of how one boy helped create the Anasazi people—a story that also provides timeless lessons for boys making the difficult transition to manhood. A must-read for that young adult in the family. Dan Robison has been writing fiction about Native American and Hawaiian cultures for many years. He studied Native American Spirituality under The Rev. Roy Wilson, who is the traditional spiritual leader of the Cowlitz Indian Nation. Dan ("Dancing Elk Child") lives in Spokane, WA, with his wife and two cats.